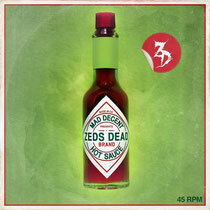 Canadian DJ/production duo Zeds Dead, made up of members DC and Hooks, will release their Hot Sauce EP via Diplo's Mad Decent label on January 29. The follow-up to last year's ‘Mad Decent’ EP, ‘Victor’, features five instrumental tracks that find the duo exploring more sonic territory with their music, further proving that they are a versatile electronic groups. Since their 2010 debut, ‘Rudeboy’, the group has been packing out venues all over the world, including last year's Mad Decent Block Parties in LA and Toronto, and have forged ahead with every release, mastering many types of electronic music. From the opener, ‘Demons’, a nightmare inducing track with heavy, pulsating synths as well as keys and strings plucked straight from classic horror films to ‘Mr. Sub’, which displays a more minimalist approach from the duo with a bouncing bass and touches of space-disco synths and ‘Rave’, a breakbeat monster that hits fast. Also coming will be a video from acclaimed Black Swan choreographer Benjamin Millepied. Check the teaser below.